Ceramics 1-4, grades 9-12 all in the same room. 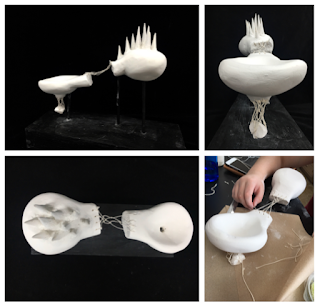 18 Ceramics 1- all handbuilding; 6 Ceramics 2- all throwing (and surface embellishments); 3 Ceramics 3 and 3 Ceramics 4- Combo of hand building and throwing, functional and non-functional focus. 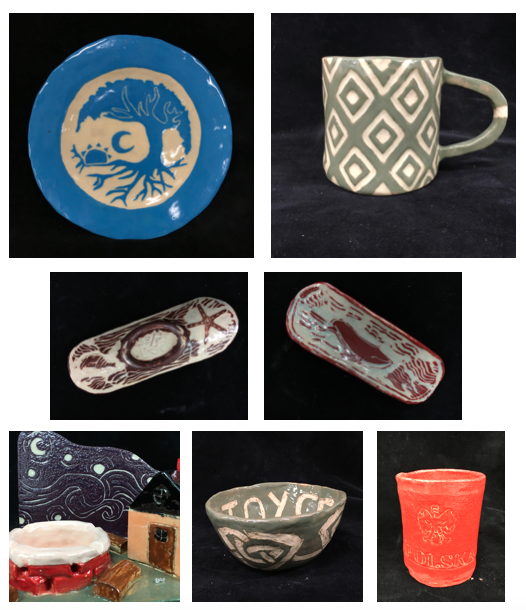 In this post I will focus on showing ONLY ceramics 1 so as to keep this clear and concise. UPDATE: I have added what the Bootcamps look like for Ceramics 2, 3, and 4 at the bottom. 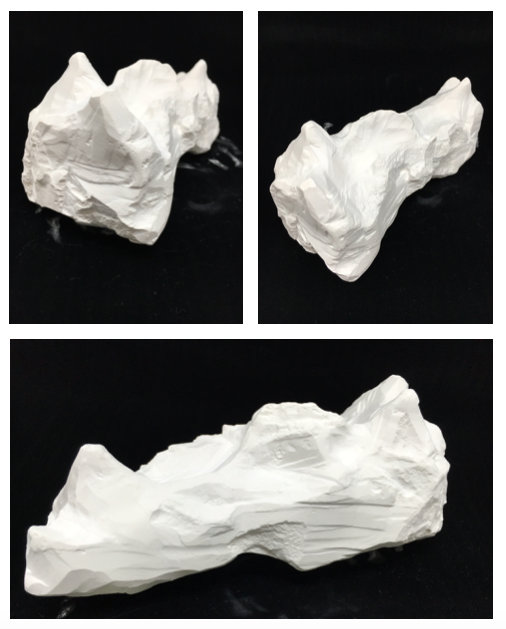 This became a SAFE, FORMATIVE PRACTICE for the students to explore how the clay worked without feeling like it had to be perfect on the first go. They got to see what worked and what didn't, what they liked, what they didn't, what the limitations of the clay were, or practice their fine motor skills... all for relatively low risk. 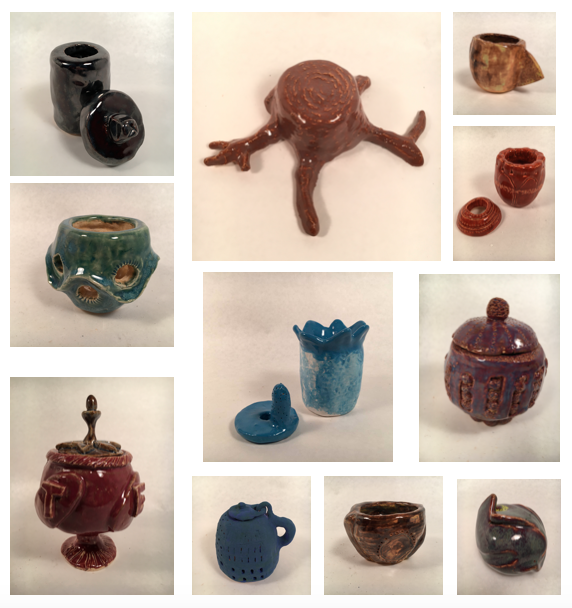 Coil: Students first created bowls (for our empty bowls event) by creating coils and pressing into the existing bowl. They then created mini coil vessels using a template they create. Slabs: I demonstrated both hard and soft slab techniques, and sgraffito. Here, students could make whatever they could think of using soft or hard slabs and then they had to sgraffito their forms. In the past, I had my students create soft slump/drape bowls and hard slab lanterns or houses of some kind. Again- excellent projects! Just not the most amazing ARTWORK. Here are some FORMATIVE examples of what my students created. By allowing my students to problem solve what THEY wanted to create, using the same skills and techniques I needed them to demonstrate, students will push themselves beyond what they thought they were capable of creating. This is because they WANT to create the artwork and have genuine interest in the overall success of the outcome. Glaze: Students learn about the various glazes we have available to us and how they work. 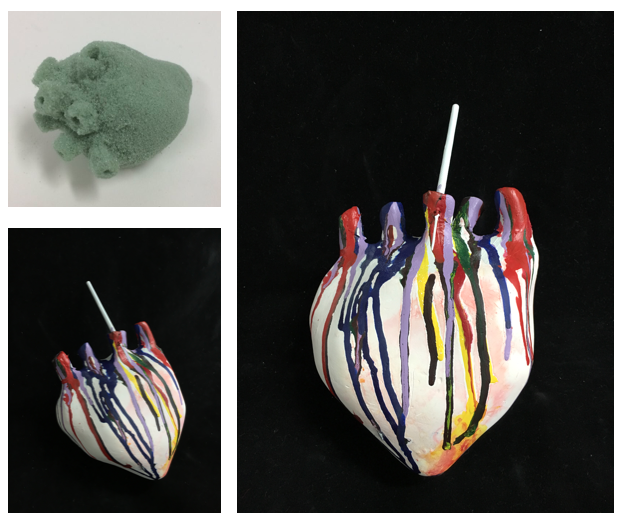 This way, students have a choice to experiment on their small formative works to see what that glaze looks like when fired. A lot of students enjoyed this because they later used these pieces when making decisions on their SUMMATIVE ARTWORKS. Please forgive this horrendous photo of my rubric. My computer crashed and I can't find the original. If I find it, I will repost it. 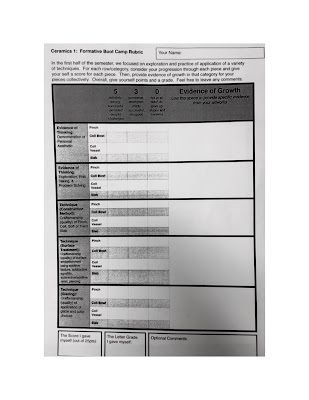 Students filled this out and provided Evidence of their Growth from project (in this case I kinda' use this word because they are safe practice pieces) to project. We have a huge literacy push currently; students are expected to provide a claim statement and provide evidence. 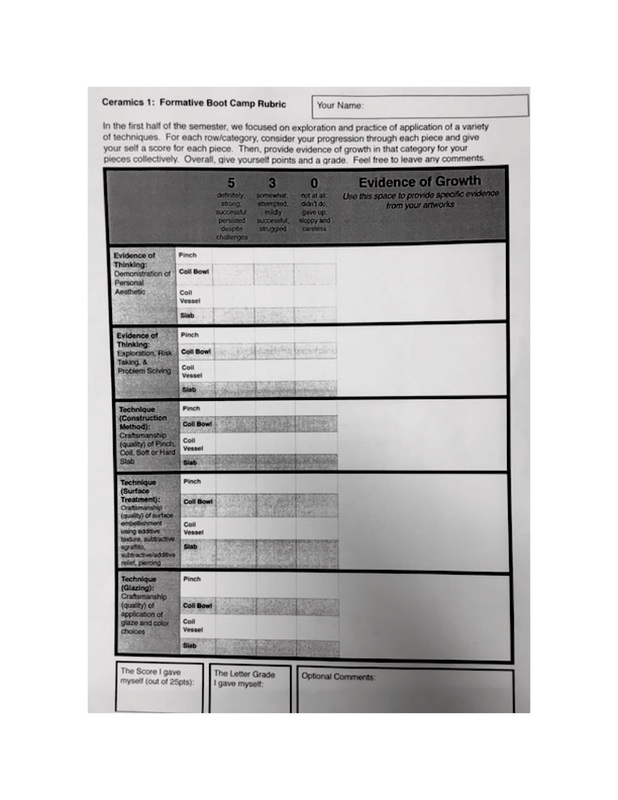 While I do this for everything I teach anyway, I feel this is a great tracker for documenting growth and understanding, documenting for your evaluation, and a great FORMATIVE practice for students to rewrite in preparation for their artist statements later on. Again, I grade this all as formative for low risk and buy-in. Now... even though this is all formative grading, these are the ONLY grades in the grade book. The summative grades (which will be worth more) don't come into the grade book until Q2 when they create their "artworks." So, even though these formative grades will eventually wash out mostly, they show as higher risk for their overall grade. So, that's great for the kids who need a little reminder that, indeed, ceramics is not a blow off, but you will also have to remind other kids (you know the ones... they stress over everything!) that these grades will not be worth as much in the long run, and not to worry! Because, after all, this is just practice... when you go to APPLY what you've learned, you will have a chance to SHINE! Note: This is also the time I have them create their Google Slides portfolio, ensuring that they have their images of their work in there from the bootcamps. I will show you what those portfolios look like in my next post on Q2. 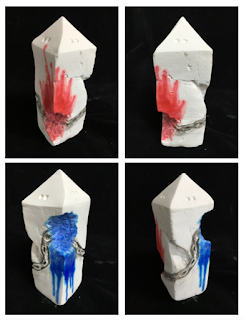 3 Artworks based on Artistic Behaviors, demonstrating skills learned, using concepts of their choice. Students filled out a Project Proposal for their intended artwork. (See below). They could take "as long as" needed, but needed to budget their own time on the scale and complexity of the artwork. In some cases, if a student was creating a very complex artwork, they might be waived from having to complete 3 artworks down to 2. Each Artwork has a rubric/self assessment and artist statement and title to be stapled with the proposal and planning sheets and turned in with the completed artwork for a grade. Ceramics 2 spends the semester learning fundamentals of how to throw on the wheel. 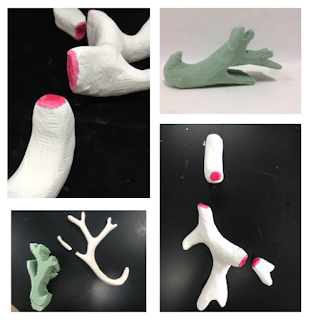 For each set, students receive formative grades based on the piece in greenware state. For each set, students then choose an Artistic Behavior, create a project proposal, and then modify or embellish to demonstrate their concept. These then receive a summative grade as artwork. While their technique is still part of the summative grade, it is how they address the form to convey meaning that is weighted. They submit proposal with planning and research, as well as an artist statement and title for their summative grade. Begin by demonstrating their throwing proficiency, teaching the 2's how to throw and then throw 3 "perfect" 8" cylinders. This keeps them busy so I can teach the 1's, and flip flop to the 2's. I don't teach bootcamps up front with them, as I'm not sure how I could truly be teaching and demo-ing to all 4 levels all within the first two weeks. They begin with their cylinders, I cut them in half lengthwise to look at the wall and technique, and toss them into reclaim once they have 3 A's in the books. While they are working on that in class, they continue outside to develop through the Artistic Behaviors. We discuss what that means, and how they will then be spending the semester developing 3 "MAJOR" Artworks. I explain that "MAJOR" means that the pieces are sets of works, an installation of some sort, or something elaborate and/or complex in meaning and technique. Some might say, how do you know if it fits this description? I say... I don't. When a student proposes something, I push them to think further and further until we are all happy with where the piece(s) will "end up." Obviously a lot can change during the execution phase as well, so there is built in flexibility. I find that the best accountability is to have consistent conversations with the students, questioning their work, thinking through ideas, getting peer feedback. Some students will research ideas and artists and decide that they want to try something such as throwing a closed form, throwing a lid, adding a variety of materials after firing, try an experimental glazing technique, slumping glass, etc. It is in that I hold the quick "bootcamps" for these kids. We pause for a day or two, everyone watches and tries these skills, but not all students will want to actually utilize that skill in their artwork. That's okay with me. Making very specific choices on how to create/construct their particular artwork is essential. We aren't here to force them to create artwork (at this point in their career) around that form or skill, but give them the opportunity to learn that skill and decide if they would like to use it to create their artwork. In the next post I will share with you my planning sheets, project proposals, rubrics, student examples, growth portfolios, and more. A shout out to my friend and colleague who taught me a lot about teaching ceramics, Shay Rehs! While we don't necessarily teach the same way, it is her structure that allowed me to fumble less through this process and have a great foundation from which to start! About 2 years ago now, I first learned about TAB- Teaching for Artistic Behaviors. The idea was interesting, and I joined the Facebook TAB for HS Group to learn more. I'll be honest here- I'm not entirely sure if I'm doing it "correctly" in my classrooms, but I do what works for my students (so far) and continue to adapt and reflect on that each and every semester. You can see a bit of my journey in my previous posts: Something Kinda' TAB-ish, and Something Kinda' TAB-ish part deux, and TABish and More- NAEA 2017 Presentation. The setup: Teaching a class of 18 Ceramics 1 students (all hand building) in one classroom, and a class of 10 sculpture students in the adjoined room. These 10 sculpture students were juniors and seniors- many I recruited to get the program started. They were an ideal group of students to challenge my teaching because they were all very smart, very creative, and in general a great group of students receptive to out-of-the-box teaching. These kids were self directed on the most part, so I was able to run between the classrooms without worrying too much about keeping them engaged. We have class every day for 53 minutes, and it is a semester long class. I began the class by explaining how this is new for me, and how we are going to try this together. We talked about Artistic Behaviors- ways in which artists think and approach creating and their own personal creative process. This is how we approached our units. 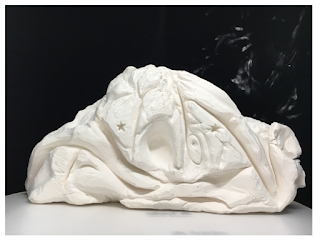 For example, I taught a unit on subtractive processes, and I feel it is important (and fun) for the students to learn how to pour and carve plaster. In my previous class, I taught this by showing a powerpoint on abstraction and showing examples from Henry Moore and Barbara Hepworth. Students made sketches and started creating. If they made mistakes, it wasn't that big of a deal because we talked about how their work can morph from those mistakes, and since it was abstract, there was less risk. This time, I started the unit talking about How Artists Observe. I can't even tell you how different this was for me, and my students. Starting this conversation, the students kind of stared at me. I asked them, "In which ways do artists observe, before they create?" The conversations transformed from "with our eyes" to "by feeling an object with our eyes closed" and then into "listening to the community discussion." It was amazing! Then, students researched and sketched their ideas from THEIR observations. 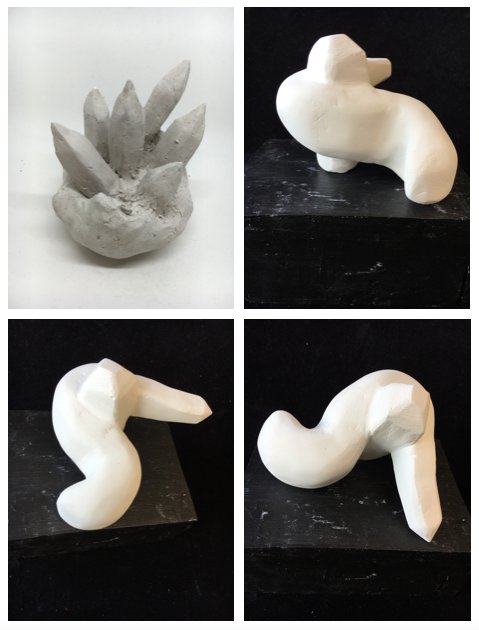 They created additive clay maquettes, practiced subtractive techniques with floral foam, poured plaster of their choice of size, and carved away! Lastly, we talked about ways to display the work (on a pedestal, handing on a wall, hanging from the ceiling...). 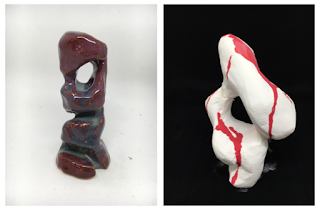 Can you tell what these pieces are about? 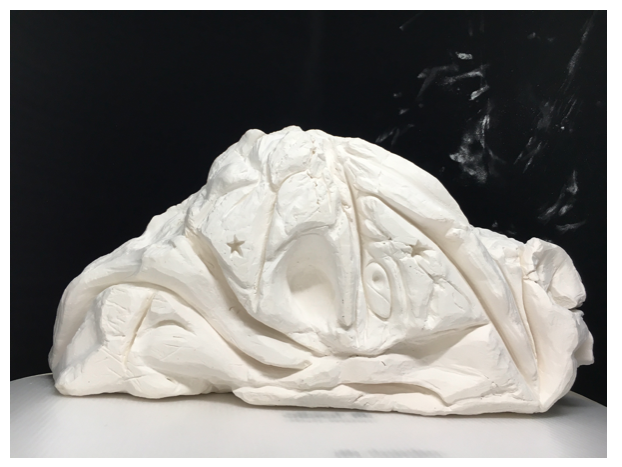 You might notice how some students changed their artwork from maquette to subtractive plaster artwork, or how some faced the challenging and frustrating limits of the materials (oh no! It broke! now what?!). I found it INCREDIBLE to read about each student's journey in researching, creating, and creatively problem solving, and discussing these artworks, the deep personal meaning they had with these works, and the investment and engagement was phenomenal. Their critiques were profound as they discussed these ideas and the various ways to communicate visually, as opposed to looking at and critiquing the same "project." I was impressed by how my student artwork looked so different than it had prior, even though it was the same material and technique being demonstrated. Observed how water travels and carves out space. Heard about the word Biomorphism and researched. Researched geometric prisms combined with organic matter. heart to demonstrate her passion for ceramics. Researched mountain ranges and trails. Discussing the Syrian Refugee crisis. Demonstrating the highs and lows of mental illness. As promised, here is the presentation my colleague, Anna, and I gave at the NAEA 2017 Conference in NYC. This outlines my journey to a choice based/ TAB style classroom and how I worked wth my students to use video to document and make this learning explicit to the community beyond the classroom. In doing so, Anna and I applied for and received a grant to create an Interactive Gallery using an iPad Pro, creating and interactive gallery experience in our school. We highlight this process that we went through to work on this and some of the roadblocks we ran into and overcame to make this experience happen. In my next post, I will explain a little more about how I moved my classes (one at a time) to TAB/Choice Based Curriculum, what that looked like for me and my students, and what were the benefits that I saw occur in my students' education and art creating. Stay tuned!